The procedure for divorcing a military spouse in California is the same as the procedure followed by civilian residents. You or your spouse must be able to claim California as a legal residence. When this condition is met, you'll file for divorce in the California county where you or your spouse reside. 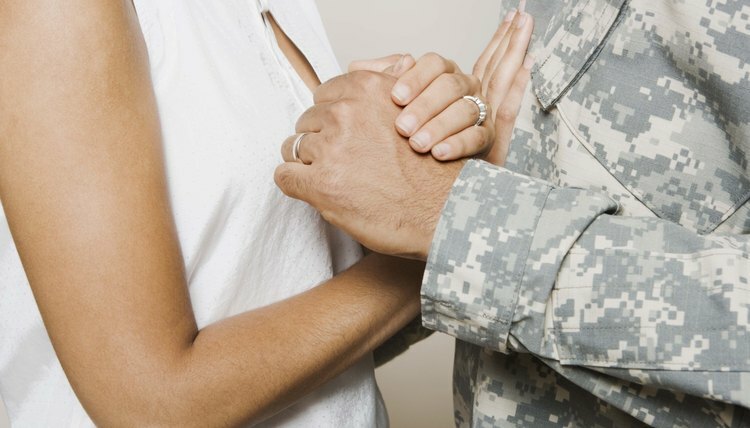 Although the procedures for military and civilian divorces are the same, there are some unique conditions that you'll need to be aware of when divorcing an active duty military spouse. If you've been a resident of California for six months and a county resident for three months, you can file for for divorce in California by filing a "Petition for Dissolution of Marriage" with the county superior court. Your military spouse does not have to be in the state when you file. California law, however, requires that the non-filing spouse is notified of the proceedings regardless of where he is stationed. When you file for divorce in California, the non-filing spouse needs to be served. This means that your spouse must be officially notified that you've begun divorce proceedings. If your spouse lives off-base, the process is identical to a civilian divorce. The papers can be delivered, "served," in person or by mail with a Notice and Acknowledgment of Receipt. If your spouse resides on a military base, he may be served in person by a process server or sheriff. If you have trouble doing this, contact base officials for assistance in making the service member available to receive service. Overseas military personnel can often be served by certified mail with return receipt to their Army Post Office or Fleet Post Office address. Be aware that some countries require service through specific channels. Not all military facilities are set up to receive certified mail or process the required return receipt. If you have any questions about a particular duty station, contact the office of the base commander or base operations manager. Federal law makes delaying military divorces easier for active duty service members, especially when there are contested issues of the divorce. The Servicemembers Civil Relief Act allows active duty service members to delay certain civil proceedings, including divorce, for 90 days or longer. This allows service members to postpone the divorce process when their service, particularly overseas, prevents them from participating in the proceeding. Summary dissolution is a quick and simple way to get a divorce when the divorce is uncontested. To qualify for a summary dissolution in California, you have to meet certain requirements, such as being married for five years or less, have no children, possess minimal assets and debts, and neither spouse is seeking alimony. If you qualify, both spouses complete, sign and file a Joint Petition for Summary Dissolution. A spouse deployed overseas can sign the petition and any other necessary forms then return it to the other spouse by mail who then files the joint petition on their behalf after adding her signature. Two self-addressed stamped envelopes, one for each spouse, must be included with the petition.